Tony Pulis, manager of West Bromwich Albion, is a “LIAR”. So says the Sun, which leads its sports coverage with news that Pulis has been told to pay Crystal Palace £3.7m – but his total bill following defeat in a High Court fight is closer to £6m. The Mirror and Express say it’s around £5m. The story goes that Pulis was paid a £2m bonus for saving Crystal Palace from the drop when he managed the team in 2014. Palace said he was due the money if he stayed at the club until August 31 2014 – after the season had kicked off on August 16. Pulis asked for the bonus early, saying he had an “urgent” need for the cash to buy land for his children. He got the cash on August 12. 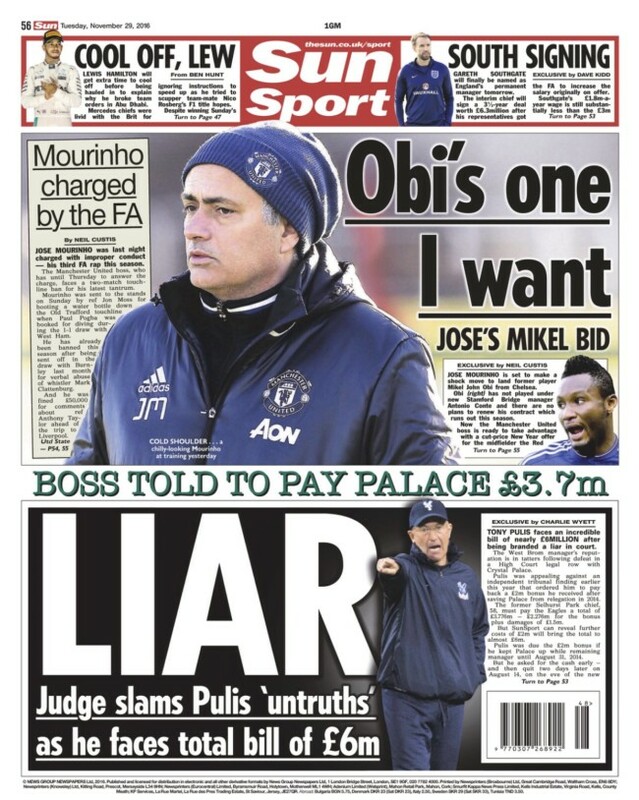 On August 13, Pulis told Palace he wanted to leave, says the Express. Pulis left the club on August 14. The matter went before an independent tribunal in March 2016, which ruled in Palace’s favour, saying Pulis had created a “false impression” that he would remain at the club. Pulis took the case to he High Court. And lost again. The Sun says the case hinged on the date of a “fiery meeting”. Pulis, reportedly, claimed his loyalty to the club was damaged following a “heated player meeting” on August 12. But Palace were able to prove that that meeting occurred on August 8. Pulis must repay the £2m bonus plus £1.5m as he was “already in employment with another club”. The Mail says Pulis has been “branded a fraudster”. He “deliberately mislead” Palace chairman Steve Parrish over his intention to stay at the club. The Mirror says Pulis’ “reputation is in tatters”. The rest of us marvel at how much money and greed there is in football.